WARNING-This is a long post. It took me nearly 59 years to get to all 50 states! Made it to State #50! On September 8, 2015, I set foot on the side of the road just north of Brattleboro, VT after we crossed over the Connecticut River from New Hampshire on Hwy 9. I got out and took a selfie of myself under a Welcome to Vermont sign. I had finally set foot in my 50th US state…a nearly 59 year journey. Following is a state by state chronicle of my nearly 59 year journey in order of states visited. 1- Ohio (1956): I was born in Cleveland in the Little Italy section of town to Joe Laurienzo and Orene Goldberg. My next visit to Ohio wouldn’t be until 1993 when I made a trip to Cleveland to visit a Ford plant. It was a fly in and fly out affair. I had hoped to get to my birthplace, but it wouldn’t be until a couple of years later…too late to meet my natural father. Since then I have made dozens of trips to or through Ohio. The house I lived in after I was born. It is still on Murray Hill Road in Cleveland. Murray Hill Road in Little Italy, Cleveland. 2- New Mexico (1957): In August of 1957 my mother left her husband and took me to her home in Albuquerque, where I spent the next few years of my life. I still have memories of our little duplex and then our house up in Snow Heights on the west side of Albuquerque. My step mother actually spent the last yeas of her life in the place where she spent much of her youth and is buried behind a Catholic Church in Jemez Springs, where she lived out the last ten years of her life. 3- New York (1959): I don’t recall any of this trip, only from photos. My step father Joe Kravetz was from New York and I believe we went back for a family visit and to visit Grandma Kravetz. Of course, in the past 56 years since, I have been to many places in New York, much of it in 2008/2009. I did get to visit my grandmother Kravetz in Tarry town a couple of times, fortunately. I visited NYC in 1990 and this is a photo with the original World Trade Center Twin Towers. A visit to West Point in New York in 1986. 4- Texas (1967): My first real road trip! We moved to Richardson, TX, then practically a rural suburb of Dallas. Back then the Dallas Cowboys still played in the Cotton Bowl. We took Route 66 through Amarillo. I still have fond memories of that trip from nearly 50 years ago. and in some ways have retraced those steps, including a trip back to Amarillo in 2014…on Route 66. My step father, who worked for Skaggs Drug back then, was transferred from Albuquerque. During this early time, my natural mother left me and my brother with our step-father Joe Kravetz. I did not see her again until 1975. I have actually driven across Texas north and south as well as east and west numerous times. There is a part of me that remains Texan in spirit I think. 5- Oklahoma (1968): As we moved to Denver, we passed through the panhandle of Oklahoma. My first trip through any part of that state. I have passed through a few times, but have also made some earnest visits to the lands first settled by my great grandfather Paschal Hanks, who participated in the Cherokee Run. Much to my surprise, there are many places in Oklahoma, especially in the southeast corner, that are extremely scenic. Oklahoma is Okay…and so is Okay, Oklahoma, which I visited in 2012. 6- Colorado (1968): My step father was transferred from Dallas to Denver in 1968. We moved to the suburb Lakewood where I had my first view of the real Rocky Mountains. As an 8th grader I climbed up Long’s Peak (halfway anyway…a storm stopped the remainder). We visited Mt. Evans, which, at that time had an immense log/rock visitor’s center/shop. I saw mountain goats, spectacular lakes, etc. Over the years I have had the opportunity to travel all over Colorado from the mountains to the deserts to the high plains. Indeed, Colorado is one of my favorite places in the United States…I love the mountains. 7- Wyoming (1969): In 1969 I began delivering the Denver Post in my neighborhood. It was a bike route. I had big bags on both sides of the front wheel. We were in a growing neighborhood and I eventually won the Denver area subscription contest which landed me (and my brother Danny) a trip to Cheyenne, Wyoming for the Frontier Days rodeo. It was my first bus ride as I joined two dozen other junior high and high school kids on this Denver Post sponsored trip of a lifetime. 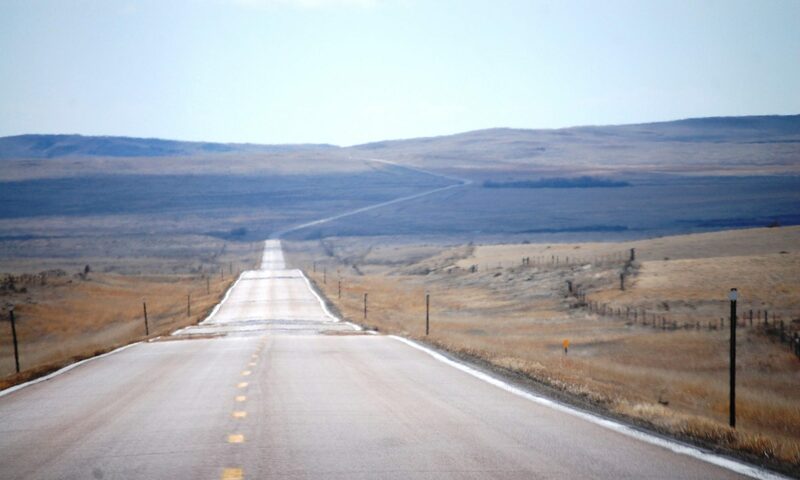 I have since had numerous trips across Wyoming, including a hitchhiking adventure as a junior in high school after literally running away from home. I made it to Yellowstone and then across the Wind River Canyon and eventually into Denver. Like Colorado, there are some amazing places in Wyoming, my favorite being the Grand Tetons and Yellowstone. In 2014 a dream of mine was fulfilled as I got to drive the Beartooth Scenic Highway at 11,000 feet on the border of Wyoming and Montana. One of my most favorite and memorable one day road trips ever. At Top of the World, WY on Memorial Day 2014…this was at 11,000 feet high in the Beartooths. 8- Montana (1970): In the summer of 1971 my step father was once again transferred. This time we moved to Great Falls, Montana. It was long drive, all the way through northern Colorado, completely through Wyoming and then all the way to Great Falls. It was there that I got into my first year of high school at Charles M. Russell, where I was in band and also on the cross country and track teams. While in the marching band, we made a trip to Moose Jaw, Saskatchewan, through Alberta…my first venture out of the United States. I ate spudnuts in Lethbridge and had a great time on the bus! I was given the name “Monty Montana” by my high school friends in Murray in 1973 because I talked so much about it. In many respects I am still a “Big Sky Guy.” After my daughter Amaree married, they lived in Great Falls, so I have been back to my favorite US State well over a dozen times since 2005. The mountains of Glacier National Park are always calling me. Our house in Bozeman, MT in 1973. It was located in Bear Canyon, south of town. 9- Idaho (1971): As I noted above, I was on the track team and we took a road trip to Pocatello for a tri-state track meet. Soon thereafter we moved to Bozeman, MT. While in Bozeman the band also took a trip to Alberta, my second venture to a foreign country. I have since made numerous trips to Idaho and have been all over the state. Perhaps my favorite time was in 2013 when I spent a number of weeks in Idaho for work and traveled all over the state, including to my favorite place there, the Sawtooth Mountain Range. 10- Utah (1973): My dad was once again transferred in the summer of 1973 and we made our way to Murray, Utah, a suburb of Salt Lake City. While in Utah I worked for a company that had me traveling all over the state and across southern Wyoming. Lots of driving…I loved it. In 1975 I joined the LDS (Mormon) Church and in 1976 went to Japan as a missionary. Indeed, our move to Utah was in many respects a life changing move as I also met my dear wife Julianne there and consider most of best friends to be there. 11- Nevada (1974): Traveled to Winnemucca, NV with a church group while living in Murray. We then traveled to Reno. My next trip to Nevada was as Tour Bus driver in Flagstaff, AZ 1982. I got to drive a bus through downtown Las Vegas on a Saturday night. Other than a couple of visits to Hoover Dam, I have not been back to Nevada in many years. 12- California (1975): By 1975 I had joined the LDS Church and was preparing for a mission. At age 18 I could finally make my own decisions and chose to fly to San Francisco to visit my natural mother, the first time I had seen her since 1963. She lived in Marin County. It was really cool to see the Pacific Ocean, Sausalito, San Francisco, the Golden Gate Bridge. It was there that I first learned the name of my natural father and actually had a chance to call him and speak with him for the first time in 18 years. He still resided in the house I was born in. In 1976 I left for Japan on a Mormon mission for two years and returned to Utah (via a visit to my stepmother and family in Jemez Springs, NM) in February 1978. Over he years I have made a few trips to California again including trips to San Diego, Los Angeles, Catalina Island and, most recently, in 2015 I visited San Francisco and some of northern California, all the up to Red Bluff, in association with Antsy McClain. 13- Arizona (1979): I met my sweet wife Julianne in Provo, UT while at BYU in 1978. She was from Mesa, AZ and by the time we were engaged I had the opportunity to head to Arizona to visit her family. It was my first time to see the “Grand Staircase” from Zion National Park down through the Painted Desert, Grand Canyon, etc., and then eventually into the saguaro covered deserts of the Phoenix area. By 1980 we were living in Flagstaff and I was attending Northern Arizona University. I took a job as a Tour Guide/Bus Driver for a company called Nava-Hopi Tours…it was the perfect job for me and it afforded me the awesome opportunity to travel throughout Arizona, to Hoover Dam, to Las Vegas and even into New Mexico. By this time traveling and driving the roads of this great country was fully settled into my blood. During this time I visited the wonderful Red Rocks of Sedona over 100 times, the awe inspiring Monument Valley on the Navajo Reservation nearly 30 times and the Grand Canyon over 50 times. 14- New Jersey (1984): By 1984 we had moved to Mesa, AZ and I was in a Master’s Program at Arizona State University. During this time I had an opportunity to do a presentation for an event at West Point in New York as a representative of ASU’s Political Science Department. It was a thrill to fly to New York, visit family in Tarrytown, see Ossining where my step father grew up and then to visit the amazing West Point campus. While out there I took the opportunity to drive into New Jersey and up to Rhode Island and Massachusetts. I have since been there numerous times, most recently a few weeks ago on our way to Connecticut. Even visited the famed Carlos Bake Shop in Hoboken and saw the sparkle of New York City at night. 15- Connecticut (1984): My cousin lived in up in Connecticut and so, I made my first trip into the state while visiting New York. We again visited as a family in the early 2000s. In 2014 my son Seth got a job there and so we made a visit there in the summer of 2015 and spent some time on both sides of the state, including an interesting visit to Mystic. And we did not eat the pizza at Mystic Pizza. Had Thai food instead. 16- Rhode Island (1984): Visited on my way to Massachusetts while on my trip to New York. This is a small state and I really didn’t do much but pass through on my way to Massachusetts. But, I can say I have been there! 17- Massachusetts (1984): I visited Salem and the House of the Seven Gables while on my trip to New York in 1984. I visited again in 1991 and was able to stay in the luxurious Boston Harbor Hotel as I was assisting a famous Japanese movie star’s family as they sought to get their daughter into Cambridge. Most recently we drove through Massachusetts in September 2015 on our way to Maine. 18- Maryland (1986): As I finished up my MA degree and began Doctoral studies, I was asked to interview with the National Security Agency. I was flown out to Columbia, MD for the interview. This would not be my last visit to Maryland, but it was my only visit to the NSA. In 1996 we drove up along the Delmarva Peninsula, into Silver Spring to visit my aunt and see the LDS Washington DC temple while our exchange student Barbara was with us. We most recently drove across the narrow panhandle of Maryland on our 2015 trip to Connecticut and New England. 19- Illinois (1989): In 1987 I took a position in Japan with the Oita Prefectural Government as part of the Japan Exchange and Teaching Program. Our entire family moved there and we were in Oita for over 4 years. As my two years came near an end, I did some work with Norbest (the turkey processing company), Japan, out of Osaka. They took me with them to the giant Food and Beverage show in Chicago. We then visited one of their facilities in Minnesota and Fargo. Over the years I have been to all parts of Illinois, along the Mississippi, to the heartland of the state and even back to Chicago. 20- Iowa (1989): I first traveled through the corn fields of Iowa on my way west. I didn’t stop for much. But, I have since stopped in many places in this state, including the home of the TV Show “American Pickers” – Antique Archaeology, Pella – home of a giant Dutch Windmill, the house that the famed painting American Gothic depicted, and more. 21- North Dakota (1989): Flew into Fargo on our way to the Norbest facility in Minnesota. I have since made eight trips across North Dakota and have traveled the majority of this lovely state. My favorite trip, of course, was down the Enchanted Highway, a quirky traveler’s dream highway! 22- Minnesota (1989): We drove to the Norbest turkey processing facility in Minnesota. That was an interesting trip watching them process turkeys. In the 2000s I have made six trips through Minnesota, including a trip across northern Minnesota on US Hwy 2, which fulfilled a life long dream as I got to visit Bemidji and the huge Paul Bunyan and Blue Ox monuments that had been there since the 1950s. 22a- Washington, DC (1990): After my two year stint with Oita, I went to work for an Oita based company called Asahi Solar and this job provided a number of opportunities to travel back to the U.S. During this time we visited solar facilities in Colorado, Arizona, Texas and beyond. We also made a trip to Washington, DC and New York City for business during the Christmas season. I also visited Delaware, Virginia, Maryland (my aunt lived in Silver Spring). 23- Virginia (1990): During my time in Washington, DC I rented a car for the weekend and drove south to Norfolk, visiting historical sites along the way. I then headed north to Delaware. This was my first venture on the famed Chesapeake Bay Bridge-Tunnel. I have made six other trips to Virginia since. Much of the western part of the state is still wild and wonderful. 24- Delaware (1990): Once I crossed Chesapeake Bay I arrived in the Delmarva Peninsula and made my way to Rehoboth Beach…and had my first sighting of dolphins in the Atlantic Ocean. It was a wonderful experience. I also ventured back into Maryland and made my way to Annapolis. My next and only other visit was in 1996 with my children. 25- Florida (1990): This was a banner travel year for me. On my earlier trip that year we coordinated the sponsorship of two Solar Cars…one for Colorado State and the other for my Alma Mater Arizona State. These cars would participate in the first ever cross country solar car race in the United States, called the GM Sunrayce. As the coordinator of the project I had the opportunity to join the team in Orlando, FL for the start of the race. This was a great trip to Disneyworld, where we stayed. While in Florida I visited the Everglades and made my way to Jacksonville, and then flew back up to Washington DC for more business. I have only been to Florida one other time with some Japanese to visit a Rolls Royce dealership in Daytona Beach, of all places. I think a good solid Florida road trip is in order in the future. 26- Indiana (1990): I continued to follow the GM Sunrayce into Indianapolis over backroads lined with tall cornfields. I was hooked with backroads driving again. Honestly, I was awestruck by the green and the miles of corn fields as I drove north into Indiana and then on to Detroit. Like Illinois, I have been all over Indiana. The Children’s Museum in Indianapolis is by far one of the best in the country. And, who can forget the iconic and quirky Santa Claus, IN? Indiana turns out to be my “halfway state” but I didn’t realize that until writing this. 27- Michigan (1990): The GM Sunrayce completed the event in Detroit. Both of the cars finished, but not too far up the pack. The Sunrayce was amazing to participate in. I finally headed back to Japan. In 2008 I worked in Woodstock, Ontario for a few months and made my way through Detroit numerous times. But, I have also spent time in southern Michigan to see the historic covered bridges, visited Hell and even spent the night on the western edge of the Upper Peninsula in 2014 as I began my US Hwy 2 trek westward to Montana. 28- Hawaii (1991): Each year Asahi Solar did an all-employee trip somewhere during the New Year’s holiday. In late 1991 it was in Hawaii, and I got to go. We spent three days on Waikiki Beach and I rented a car and drive across the island through pineapple fields and then to the Hawaii Temple and the Polynesian Cultural Center. By the end of 1991, my family was returning back to the united States as I departed Asahi Solar. It was a fun four and a half years in Oita. I made one other trip to Hawaii on business for Asahi Solar, but have not been back since 1991. 29- Tennessee (1992): After arriving back in Arizona, I found it difficult to find work. I applied all over and eventually landed a job interview in the small town of Winchester, TN with a Japanese production plant that made rubber molding. That was an adventure as I landed in Nashville, dressed in my suit, rented a Lincoln Town Car and then made my way south into this small rural community. I walked into the local café to grab some breakfast and was stared at by all of the farmers…I felt like the proverbial city slicker. Welcome to the south David! The job didn’t pan out and I went back to Mesa, AZ with my family. Of course, since Tennessee is so close to Kentucky and my great friend Antsy McClain lives there, I have been back there a number of times. 30- Missouri (1992): I was soon on my way back to the “south” after landing a temporary contract position with a Japanese production facility in Shelbyville, KY. I drove out there from Mesa, AZ and made my way through New Mexico, Texas, Oklahoma, and then northeast into Missouri. I got my first view of the great Arch in St. Louis on this trip. Missouri is one of those frequently passed through states on my way west, but I have not missed out on the wonders of this state as well as the quirkiness. I have a close friend in Kansas City and love the BBQ there. But, Tightwad, Peculiar, Success and Romance are places I seem to remember the most. 31- Kentucky (1992): Eventually, I made my way into Louisville, where I would live and then drive the daily 30 miles east to Shelbyville. That gig lasted about 8 months. It was there, at Katayama American that I eventually met my now very close friend, Ron Bell, who goes by the stage name Antsy McClain. That is another story, but, through him I have also had opportunities to travel this great country and be part of an amazing musical adventure that had some of my dreams fulfilled. Ultimately, in 1993, the entire family moved to Kentucky as I was hired full-time by a company in Frankfort, KY – Ohi America, another Japanese parts manufacturer. We have lived in Kentucky since 1993 and love it here. I have literally traveled most of the back roads of the state, been to the highest point in southeastern Kentucky, been into the depths of Mammoth Cave, been to the Kentucky Derby and traveled the Bourbon Trail (without drinking any). 32- Kansas (1993): As the family left Arizona in July 1993, we made our way north from Mesa, AZ into Flagstaff, to the Grand Canyon, on to Monument Valley in southern Utah, then to Four Corners. From there we continued east through Pueblo and into Kansas, eventually staying one night in Dodge City. I have been across many parts of Kansas and learned some of the interesting history of this cattle filled state. 33- West Virginia (1996): In 1996 we hosted a French exchange student named Barbara. During her visit we took a family trip to the East Coast, just me and the kids. On this trip we passed through West Virginia and went to the New River Gorge. We then went through Shenandoah NP in Virginia, visited Williamsburg and Jamestown and then made our way to Norfolk and revisited the Chesapeake Bay Bridge Tunnel with the kids. We then made it into Delaware and Maryland…including crab cakes at an old crab shack on the Delmarva Peninsula. Taken on a drive through West Virginia in 2015. Been there many many times. 34- Georgia (1997): As members of the LDS Church, we made occasional trips to the temple. In 1997 our closest temple was near Atlanta, so we made a couple of trips there to do baptisms for the dead with our older children. I later made many trips to Georgia for iHigh.com while visiting high schools in the Atlanta area. In early 2013 we made a trip down to Georgia to pick up a trailer and got to visit Savannah and also made our way to the humongous Stone Mountain. 35- Pennsylvania (1998): My oldest daughter Amaree had graduated from high school and was invited to participate in a national choir that was tour Europe. That same summer our second daughter Marissa went to France to visit our former exchange student Barbara. Amaree needed to be dropped off in Pennsylvania so we made the trip there, let her go with the choir and visited the Gettysburg National Park and it happened during the 135th anniversary of Pickett’s Charge (July 4th/5th) and then were tents everywhere for a huge reenactment. Was pretty cool. I have since made over a dozen trips to Pennsylvania visiting Amish Country, the Great Lakes, Bethlehem/Allentown and Philadelphia, amongst other places. 36- North Carolina (1998): After the girls returned from Europe, we took a small trip to North Carolina to do some genealogy research. I had recently discovered some of my step-mother Marge Tudor’s ancestry had come from Granville County in North Carolina, so we took a trip to Oxford to seek old graveyards, and see where our ancestors had come from. It was a unique opportunity. I have made a few trips to North Carolina since (mainly for iHigh.com) and even visited Lizard Lick and the town Mayberry RFD was centered on (Mount Airy, NC). 37- Alabama (1999): Our first trip to the deep south happened as we made our way to Houston for my cousin’s wedding and then proceeded westward to Arizona for a family visit. A long drive. We had some of the best barbecue ever while in Alabama (near Huntsville). I have made a couple of trips to Alabama since, but have not really had the opportunity to see the sights as I would like. Hopefully one day. I hear there are some amazing beaches on the Gulf Coast! 38- Mississippi (1999): We continued through Jackson, Mississippi on the drive to Houston. This was a pass through trip. During my days at iHigh I made a couple of trips there as well, but my best trip to Mississippi took place in 2014 when I traversed the Blues Highway (US Highway 61) along the western side of the state near the Mississippi River. THAT was an amazing and unforgettable trip! 40- Arkansas (2000): On our way home from Arizona we went through Oklahoma City and then into Arkansas, for our first trip there. Since that time many of us have traversed Arkansas, especially on our way to Texas. Some favorites…how about Booger Holler? I have also visited the home of Popeye Spinach and a big Popeye statue in Lowell, AR. 41- Washington (2004): I first was in Washington on an airplane flight to Japan, but never set foot out of the plane, so I didn’t count that. My first setting foot took place in 20014 when Julianne went to Seattle on our to a cruise to Alaska. I later made a trip in 2007 with Solomon for a Trailer Park Troubadours tour after a visit in Montana. I revisited Idaho on this same trip. We most recently had an amazing 10 day trip to Washington in August 2015 and visited much of western Washington, including a visit to the most northwestern point in the contiguous United States. 42- Alaska (2004): Julianne’s parents celebrated their 50th wedding anniversary by taking all of their children and spouses on a cruise to Alaska. We visited Glacier Bay National Park, Juneau, Ketchikan and Sitka. It was fabulous! I would love to make another trip to Alaska. In fact, one of my dreams would be to take the Al-Can Highway from Montana, through Alberta and up to Alaska. 43- Wisconsin (2005): My first trip to Wisconsin took place in 2005 as my two sons Seth and Solomon, joined by Marissa, traveled to Montana for Amaree’s wedding. We stopped and saw pink elephants, ate cheese and saw lots of mosquitoes. I later visited in 2007 with Solomon and we hit northern Wisconsin and visited JFK, the Twine Ball Man. I again made a three day trip with my daughter Chelsea and granddaughter Autumn, and went up the eastern Peninsula from Green Bay. Finally, in 2014 I made my way across northern Wisconsin on US Hwy 2. I like Wisconsin…at least in the summer. 44- South Dakota (2005): After my daughter’s marriage, Marissa, Seth, Solomon and I made our way back home and went south so we could visit South Dakota, see Mount Rushmore, the Corn Palace and more. I have since made it back a few times and visited other national parks and even made my to Winner! At the Corn Palace in Mitchell, SD in 2013. This was my third trip here. 45- Nebraska (2007): With all the trips across the country, it is amazing to me that I never got to Nebraska until 2007 on my trip home with Solomon after visiting Washington. Since then I have been all over the state, but have nothing better than my visit to Carhenge in Alliance in 2014. In 2012 I also visited for iHigh and got to meet Heisman Trophy winner Johnny Rodgers and actually hold his Heisman. That was pretty cool. On that same trip I worked in Omaha for the US Swimming Olympic Trials and met a number of famed swimmers. It was a unique experience. 46- Oregon (2007): My first steps in Oregon were in Pendleton after a visit to Walla-Walla, Washington while in the southwest corner of the state with Antsy McClain and the Trailer Park Troubadours. On our way back home, Solomon and I made our to Hells Canyon and Joseph. I visited Oregon a few times in 2011 and 2012 for iHigh and fell in love with Portland and Central Oregon. I have actually been along the entire Pacific Coast, visited Mt. Hood and enjoyed the breathtaking Multnomah Falls along the Columbia River. Oregon is certainly one of my favorite states. Yes, I have eaten at Voodoo Doughnut in Oregon. 47- South Carolina (2012): One would think that with all of the travel to North Carolina, Georgia, etc., that I would have made it to South Carolina sooner than 2012. But, my first trip was actually with iHigh on my way from northeastern Tennessee to Atlanta. I again visited in 2014 as we stayed in Hilton Head with Marissa and her children on our way to Atlanta and central Georgia. 48- Maine (2015): As noted above on Connecticut, we made a visit in September 2015 to visit Seth on the occasion of the birth of our 10th grandchild. Marissa and her children joined us on this 12 state trip. I had looked forward to this trip for a few months as I knew I would finally have a chance to get to the northeastern US and perhaps get my last three states. On September 7 we made it into Maine and stayed on the Atlantic Coast in Old Orchard Beach, a beautiful place, but certainly not long enough. The next day we made our up to Portland and then across to New Hampshire. 49- New Hampshire (2015): We entered New Hampshire on Hwy 25 and were in Freedom. I looked all over for a post office so I could “send a postcard from Freedom” as the lyrics to Antsy McClain’s lyrics to “Living in Aluminum” proclaim, but, alas, we couldn’t find one. Then, I failed again as we sought to get a sandwich in Sandwich. Ended up getting one in Holderness at Squam Lake Market. UGH. Welcome to New Hampshire in Sept 2015 in Seabrook – State #49! Visited Sandwich for a sandwich…..
50- Vermont (2015): And finally…NUMBER 50 on September 8. We made our way across New Hampshire via US 202 through Keene and into the Vermont town of Brattleboro. I got out and got a photo of the Welcome to Vermont sign (with me in it) to memorialize it. Though it was only the small southeastern corner of the state, I had actually made it. I have been over most of Route 66, as well as other long highways including US 2 across the northern US from Michigan to Montana, US 1 on the Atlantic Coast, US 101 in California, Oregon and Washington. All I can say is that I have been very blessed in my travels and to see this beautiful country. Of course, the 175 blog posts on this blog and the nearly 25 other posts I wrote before this blog was started detail many of the places I have been fortunate enough to get to so far. Finally, I would be remiss if I didn’t thank my good friends at Roadside America who have provided me with many great places to stop at on the back roads of this great country. I have worked with them on many occasions and provide many a photo for their site. Go to their site and get the app. You’ll be glad you did! We got off to a late start but were soon on our way northbound on Washington Highway 3 towards Port Gamble. From there we would take the Hood Canal Bridge, which is a floating bridge that connects the Kitsap and Olympic peninsulas. At 7,869 feet long, (floating portion 6,521 feet) it is the longest floating bridge in the world located in a saltwater tidal basin, and the third longest floating bridge overall. The drive northwest from Port Gamble is a beautiful drive with the Strait of Juan de Fuca to the north and the mountains of Olympic National Park to the south. Baker is the most heavily glaciated of the Cascade Range volcanoes and the volume of snow and ice on is greater than that of all the other volcanoes in the Cascades (except Rainier) combined. Apparently, it is also one of the snowiest places in the world; according to a Wikipedia article, in 1999, Mount Baker Ski Area, located 8.7 mi to the northeast, set the world record for recorded snowfall in a single season—1,140 in. WOW!!! Many of the highways along Washington 104 and US 101 are lined with walls of guant pines. Of course, this area abounds in massive trees, including some of the tallest in the U.S. Our drive would take us through large stands of Douglas fir, Ponderosa and Lodgepole Pines and humongous hemlocks. I’ll have more about these further on in this post. But I must say that their grandeur and beauty are something to take in, behold and stand amazed by. From the highway there are a few trees that stand tall above all of the others. Some of these are 150 to 200 feet tall….the height of a 20 story building!! Highway 104 soon merged with US Highway 101 (known in California and Oregon as the Pacific Coast Highway), which stretches 1,540 miles from the Los Angeles area all the way to Tumwater, Washington (technically), but continues to go north to Aberdeen and then on to Beaver, WA. called Fat Smitty’s, a really quirky, yet fun place, with my kind of funky wood carvings and more. (I’ll have a different post all about this place HERE). The whole fun of this place is not the food, which was good, but not extraordinary, but rather the atmosphere. The inside is plastered with dollar bills everywhere (and a few other denominations here and there). See more on my post. Of course, on road trips I am always on the look out for fun things and just shortly past Fat Smitty’s on US 101 we passed Chicken Coop Road. Chalk up another unique road sign to my collections!! From Sequim we next drove through Port Angeles. I had hoped we could head up to the Dungeness Spit, but not enough time. The road from Port Angeles to Neah Bay is windy and slow going (not at all “Strait” like the Juna de Fuca!!). This is actually the real gateway to the Juan De Fuca Scenic Highway. Once we hit the Clallam Bay/Sekiu area on Hwy 112, the beauty of the coast burst out before us. Lovely beaches and coastal scenes provided a change from the Pine walled highways. Just off of the highway we could see the lovely seagull covered beach of Clallam Bay and then into the small fishing town of Sekiu (pop 27 in 2010), where we caught a glimpse of the famed wooden fish named Rosie…in her swimming outfit and running shoes. HA! The drive west from Sekiu is quite scenic. To the north is the Strait and beautiful small islands and to the south was giant trees…true Northwest character. But the road is windy and slow going. Thank goodness for the scenery. Not too far down the road from the Seal and Sail rocks is the approach into the small town of Neah Bay, which is located on the Makah Indian Reservation. It is a small fishing town nestled in a corner by the Pacific Ocean to the west and the Strait of Juan de Fuca to the east. Much of the area near the Pacific is high cliffs over looking the ocean. 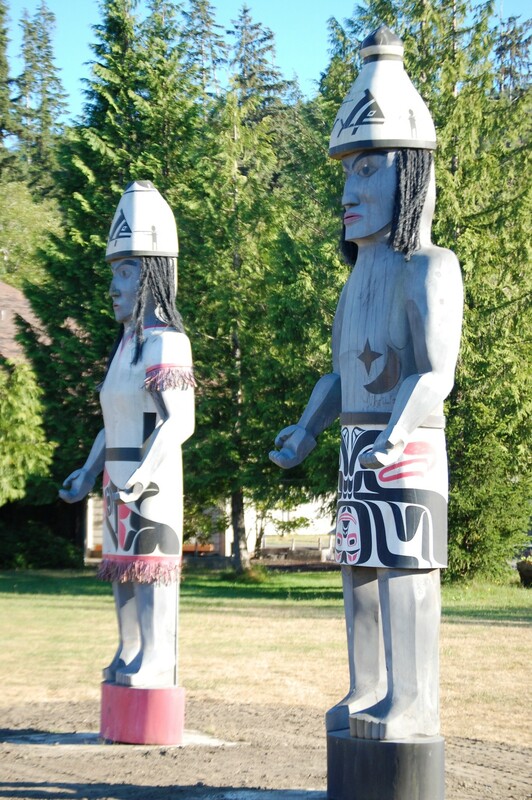 Lots of Makah Culture surrounds the town. We took this road to the Hobuck Rd. Bridge and went over the river towards the scenic Hobuck Beach on the Pacific Ocean. Upon arrival at the beach we saw a beautiful outcrop of land to the north of the beach. It was also covered in morning fog, similar to that which I had seen at the Golden Gate Bridge a couple of months ago. Hobuck Beach actually extends along Mukkaw Bay (also known as Makah Bay). This shallow bay is four miles long and is open to the Pacific Ocean five miles south of Cape Flattery. Apparently, the name of this bay is spelled as the Makah Indians pronounce their tribal name and therefore is not a misspelling, according to some items I have read. The ocean crashes in beautiful waves at this location and there are numerous rock outcroppings dotting the waters. I really loved the opportunity to sit on the beach and hear the crashing of the waves and it was also so pleasant to watch my daughter’s family play in the ocean and in the tidal pools. I grabbed a few shots of this great place…way more than can be included in this post. But here are a few of my favorites…just to provide a taste. After about a couple of hours it was time to leave the beach and return to Port Orchard. We returned through Neah Bay and then back along the Strait of Juan de Fuca Scenic byway, which presented a different view for us as the tides were changing. We followed Hwy 112 back through Sekiu and Clallam Bay and then towards Sappho Junction on the border with Olympic National Park and US Highway 101. From there we headed east on US 101 towards Port Angeles. US Hwy 101 through the mountains along the coast is really splendid. The mountains are so close and when driving along the northern boundary of Olympic National Park, you never know that you are so close to the ocean and the Strait. We actually didn’t mean to take this route as it technically took us out of our way. But I am really glad that we “suffered” through this divergence. The highway was lined with tall trees, there were some great mountain views and then passing by the scenic Lake Crescent was wonderful. Lake Crescent is a deep lake located entirely within Olympic National Park and is approximately 17 miles west of Port Angeles. At an official maximum depth of 624 feet, it is supposedly the second deepest lake in Washington. I was actually surprised at how brilliantly blue the water appeared from the road. My photos don’t do it justice, but you can see how lovely this lake is. It would be a great place to rent a cabin and take a vacation. Heck with the beach!! From our western approach, we not only saw the lake, but there is huge mountain that sits behind it protecting it. The mountain is called Mount Storm King and stands at an elevation of 4,537 feet. Many climb its scenic trail. It was getting late and we were all hungry, so we made our way into Port Angeles where we had hoped to find a place to eat. and the Olympic Mountains to the south. Extremely scenic but also, as its name indicates, it is a port town. There were big ships visible from the road as we drove into town. This is another of those places that could have used more time. On our next visit to Washington to see the family, I hope that we can spend a day in and around the Port Angeles area. But, we did have enough time to track down a place to eat, and “The Bushwhacker” restaurant was our choice. Actually wasn’t a bad place. A very friendly family restaurant that serves seafood, steaks and other things. Finally, evening approached, a full moon was in view and we drove off into the sunset to get home after a long fulfilling day. My wife and I had the opportunity to fly to Seattle at the end of July for a nice week (actually 9 days) of fun with our family out there. Over the next couple of weeks I will have a few posts about our adventures, but wanted to provide a brief preview of what we experienced: Beaches, Mountains, Sights, Sounds, Eats and Quirky fun!! The Bremerton Ferry took us form Bremerton to Seattle. Day 1: We took a ferry from Bremerton, WA and then spent a full day walking around parts of Seattle…then took a Duck ride. The ferry is followed by hungry seagulls who would swoop down and eat from people’s hands. I got some amazing closeups of the birds. Once we arrived in Seattle, our sea legs turned into walking legs as we visited the Ye Olde Curiosity Shop, Pike Place Market, walked along the boardwalk, rode the Ducks, saw the Space Needle and more. There were street musicians everywhere, lots of fish in Pike Place Market and a general atmosphere of fun in spectacular beautiful (but a bit hot) weather. Of course, a visit to Seattle is not complete without muscling your way through the massively crowded Pike Place Market (even on weekdays). Famous for its fish mongers, there are a plethora of other goods there for perusing and partaking. It was fun watching all of the people, but there is no place to stop for a sit down break and the market goes on forever and forever. One could really take a full day just visiting each merchant and seeing what they offer. But, probably better to go when school is in session. The Kravetz and Matthews family all decked out in our matching shirts Riding the Duck around Seattle. The Duck Tour does provide a fun sample of Seattle. I will have much more about Seattle in an a future post. Seattle is a fun place!! After a “Recovery Day,” we were back on the road on Day 3 heading north to Neah Bay, which is the northwesternmost point in the contiguous United States. Julianne stayed back in Port Orchard as we traveled the road along the Strait of Juan de Fuca Scenic Highway. Honestly, there may be a Strait, but the road ALONG the Strait is ANYTHING but straight. A crooked windy road to Neah Bay. As it was a long and winding road, literally, we did stop along the way for lunch at one of those quirky eateries. Fat Smitty’s in Port Townsend, WA is a real kick! Indeed, the outside wooden art is a drawing card, but the real fun is when you walk inside and see the thousands of dollar bills plastered everywhere. They claim to have over $10,000 in there. I’ll have a special post just about this place. The drive up US Route 101 along Olympic National Park and then along the Strait on WA 112 is very scenic. Mt. Olympus can be seen along with other rugged northern Cascade peaks. The Pacific Ocean scenes at Neah Bay are fabulous…and the beach is sandy. And there is all sots of strange looking seaweed up there. We took US 101 home along Olympic National Park and made our way back eventually getting to the Tacoma Narrows Bridge at sunset. Day 4 had us going down to Tacoma with the family and some of the Matthews family too. We visited Point Defiance Zoo…a smaller zoo, but with some great animals. I enjoyed watching the otter roll around and it was also a blast watching the kids feed the budgies. We saw tigers, an elephant, seals, a polar bear, etc. I’ll have a post about the zoo coming up too. I love the flowers, the animals and the joy on the kids’ faces. After a nice trip to the zoo, we returned to Port Orchard and the adults all took another ferry across to Seattle (with the car this time) to visit the Seattle Temple of the Church of Jesus Christ of Latter-day Saints. Another beautiful building…built in 1978. It is always nice to attend the temple, where we did baptisms for the dead and spent a nice evening away from the kids. The ferry ride this time was also amazing as there were some spectacular views of the glacier covered Mt. Rainier. Day 5 was another rest day. We took a visit to a regional park along the coast and Julianne and I sat there and watched the boats while the kids hiked. It was nice to chillax as the next day would be a big one. A cloud cap forms on Mt. Rainier. Our next to last day was a visit to the spectacular Mt. Rainier National Park. This is certainly one of America’s great mountain peaks. At 14,400 feet it towers above the landscape and can be seen everywhere on a clear day. It reminded me of Mt. Fuji in Japan, which I lived at the base of for 5 months in 1978. Along the way to Mt. Rainier we stopped at a fun place for lunch in the small scenic town of Greenwater. The Naches Tavern has a nice menu, walls with dollar bills all over it, lots of old implements and a GIANT Bigfoot wood carving. More about this on the Mt. Rainier post in a couple of weeks. Of course, I can’t avoid the quirky places on a trip like this and the Mattress Ranch in Port Orchard is udderly mooving with dozens of cows, bulls, chickens, lambs, rams, etc. Port Orchard also has a bay complete with old US Navy destroyers and the town has some fun wall murals. I am excited to share the details of our long trip to Washington over the next couple of weeks. Hopefully those that read it will get some fun inspiration for their own trip to Washington!